Interdisciplinary teams of Center scientists are investigating the causes for the decline of salmon and steelhead in Shasta River, historically one of the most productive tributaries in the lower Klamath Basin. A large spring complex (Big Springs Creek) provides the majority of its water, particularly during the summer. Researchers are developing innovative approaches to restoring and sustainably managing this unique resource for both native fish and for irrigating local ranches and farms. Though Shasta River provides only 1 percent of the Klamath River’s streamflow, it historically produced 50 percent of the Chinook salmon -- and it still produces enough fish to support a large proportion of California’s commercial and recreational salmon fishery. Improving freshwater habitat in the Shasta results in disproportionally large benefits for the lower Klamath Basin. Jeffres, C., & Moyle P. B. (2012). When Good Fish Make Bad Decisions: Coho Salmon in an Ecological Trap. North American Journal of Fisheries Management. 32, 87-92. Null, S. E., & Lund J. R. (2011). Fish Habitat Optimization to Prioritize River Restoration Decisions. River Research and Applications. Null, S. E., Deas M., & Lund J. R. (2009). 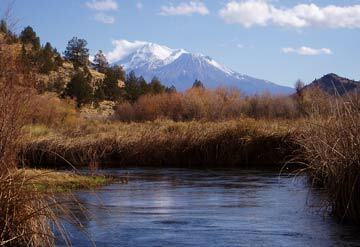 Flow and Water Temperature Simulation for Habitat Restoration in the Shasta River, California.